An easy to use remote control for 1 or 2 computers running presentation software. 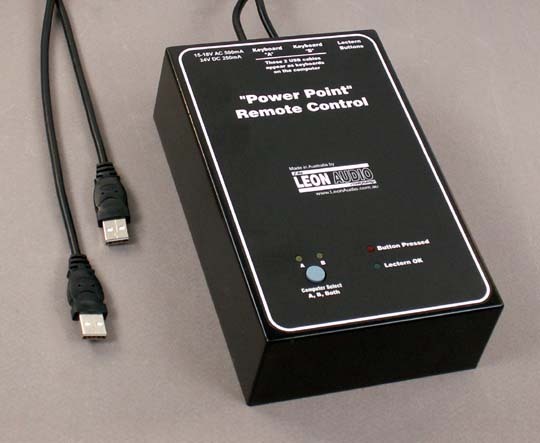 A presentation remote control for one or two computers running software such as Microsoft’s Power Point or Corel's presentation software. Very simple forward/back controls at the lectern. Cable based for maximum reliability. No infrared or radio interference and dropout problems. No flat batteries. The system consists of a Control Unit and a Button Box at the lectern. The units are connected together using readily available standard 3 pin XLR microphone cables. Maximum cable length is in excess of 500 metres. It will run down a copper audio multicore/snake. Digital snakes are not suitable as the system sends power and bi-directional data which is not supported by the audio digital snakes. The Control Unit as the ability to control two computers, either one at a time or both in tandem. This allows a presenter to be controlling one computer while the other is being configured for the next presentation; or both together for before and after slides; or for redundancy. Works with Macs, IBMs or compatibles. Selection of which computer to control is done by the "Computer Select" button which steps through the options of "A", "B" or "A+B". Monitoring of cable and connections to the lectern buttons is via a "Lectern OK" LED. The Control Unit appears as a keyboard to the PC. Control is achieved by remotely "pressing" the page up and down keys. These keys are compatible with Microsoft's Power Point and Corel's presentation software. There is no software to install on the PC so as to minimize the chances of interference from Bill Gates. The USB connections are optically isolated so that there is no electrical connection between the Control Unit and the PCs or between PCs if two are connected. Only 2 controls: Forward and Back. Nothing else to confuse a stressed presenter. A confidence LED indicates when a button has been pressed. Holding down a button will only advance one frame. It won’t ‘auto repeat’ through to the end of your presentation. The button has to be released for about half a second before it will register another press. This delay also reduces any chance of advancing more than one frame if the presenter has the shakes. An XLR to RJ45 adaptor will allow the use of CAT5 cable as well as microphone cable. Brochure for the Dual USB Remote Control system. dual_usb_ppt.pdf (300Kb) in Adobe Acrobat format .